A great day to get out and about, temperatures are going to be around 15 degrees warmer than yesterday! Highs in the mid-to-upper 60's, with some gusty NW winds. Clear skies this evening will be the cause for a good decrease in our lows. Expect us to drop down to near 50, with a light wind. Looks like the Easter bunny might be taking a relaxed trip down the bunny trail this Sunday. The kiddos might even want to take a peak outside, with weather this good it shouldn't be passed up. Temperatures are expected to get into the upper 70's thanks in part to the sunny skies and the southerly winds. Sunday night won't be as chilly with lows in the upper 50's, but still mainly clear skies. That high pressure system is going to stick around into the beginning of our work week, and continue to bring us sunny skies and high temperatures near 80 degrees. Our weather is working to give you that Monday motivation with a forecast like that! Tuesday has a few clouds returning, but they won't hide the sun that much. This is where things get a bit tricky. 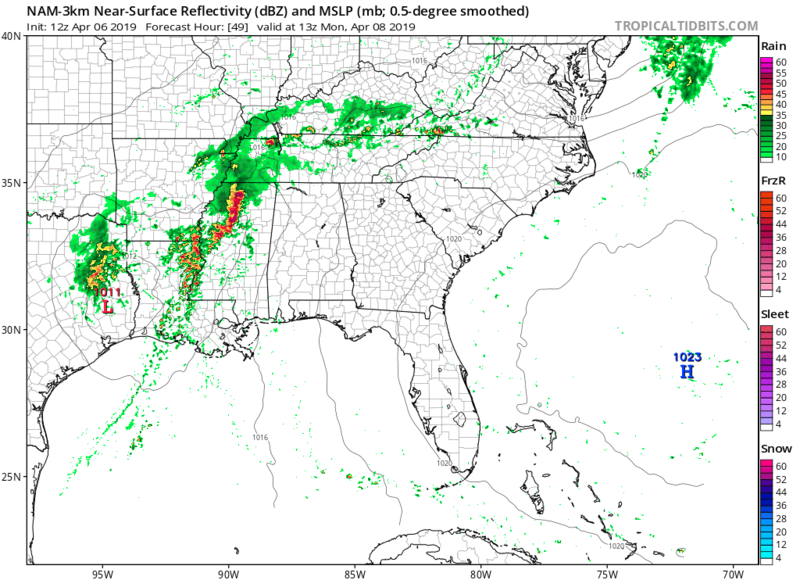 Models have been in a bit of a disagreement towards the timing of a low pressure system making it's way through the Mid-South in the middle of the week, but are starting to line up this morning. The GFS model (above) fairly closely matches the European model (below) with the highest rain chances on Thursday, which could be a wet day. There are slight chances Wednesday evening and the rain might linger into early Friday. Severe weather chances currently appear to be low, but we'll be monitoring that as we get closer to the event! Into next weekend we are going to see some very nice temperatures, typical for the month of April. Some days are a bit above average, making for some nice outdoor time. Mostly dry conditions for next weekend, with highs almost near 80 degrees. Have a great weekend, Memphians! 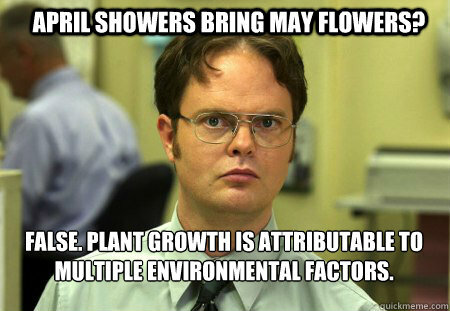 Oh April. While I love the warmer temperatures, we always begin to see an increase in severe weather activity around this time of year. From a climatology standpoint, April is when we do see the most severe weather. After what has been a somewhat quiet week so far, things will be changing tomorrow as another round of showers and strong to severe thunderstorms will be possible. With these storms, there are some flash flooding concerns. Luckily, this weekend Mother Nature looks to pay us back with some amazing conditions! If you have outdoor plans this Easter weekend, you are in luck because things look fantastic. Cloudy conditions will remain through the evening and overnight hours as temps fall back to near 63. We will see winds remain around 15 mph overnight. We've already seen a few, scattered showers develop to our south this afternoon. Luckily, most of us should remain dry until well after midnight. Rain chances will increase towards morning, with most of us receiving rain and a few t'storms by sunrise tomorrow morning as the first round arrives for the day. Heading into tomorrow, expect for showers throughout the majority of the day with heavier rain and some strong to severe thunderstorms in the afternoon. Highs will near 69 with breezy winds around 15 mph. While severe weather is possible for tomorrow, flash flooding is also a concern with the amount of rainfall we will be seeing. Expect for showers to be knocking on our doorstep by the time you wake up tomorrow morning (they'll probably arrive before many of us are up). These showers will continue through much of the day, so you'll want to keep the umbrella handy even if you have to battle in the wind with it. The best chance for a few dry hours is late morning into early afternoon. While we could see a few thunderstorms in the morning, we are not expecting any severe weather with this round. However, by tomorrow afternoon, an additional line of heavy showers and thunderstorms will be moving through the area, some of which could cause strong wind gusts. The main concerns for our area tomorrow are damaging wind gusts, frequent lightning, and heavy rain. 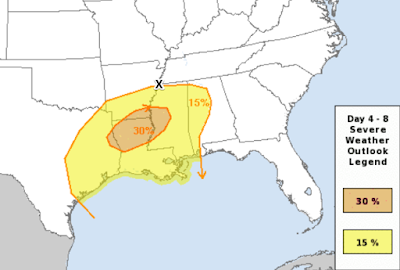 The best chances for severe weather will again be to our south across central and southern MS and LA. Much of the Mid-South is currently included in a "Slight Risk" (2/5) by the Storm Prediction Center. 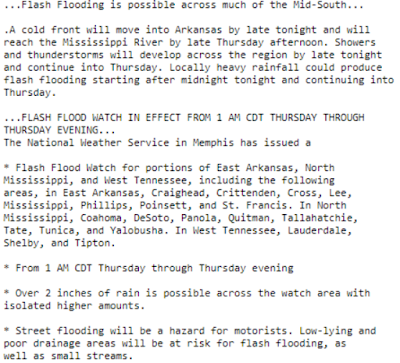 Our local NWS office has issued a Flash Flood Watch for our area from 1 AM tomorrow through 7 PM tomorrow night. We are expecting 2 or more inches of rainfall over our area. 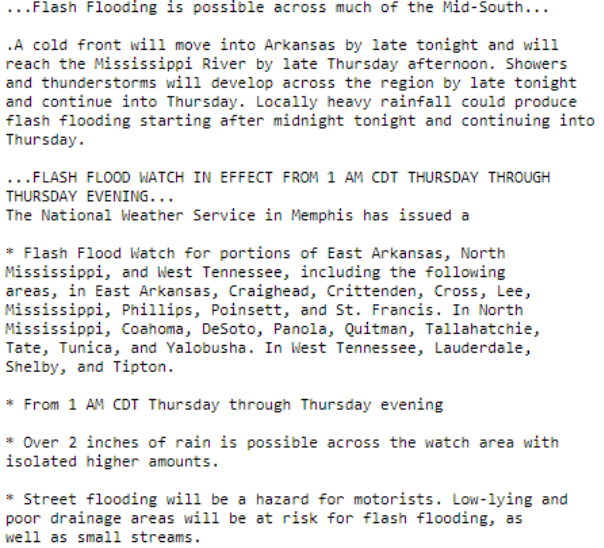 Due to this, some flash flooding could occur in low-lying/poorly drained areas. If you do happen to come across a flooded road tomorrow, remember: turn around, don't drown! As the low pressure system that will bring Thursday's showers and storms continues to drift eastward, it will do so very slowly leaving us with somewhat gloomy conditions on Friday. Shower chances will linger throughout the day, but should begin to clear out by Friday evening. Temps will be much cooler, with highs only nearing 58 and gusty northwest wind. Sunny skies and pleasant temperatures; it won't get much better than this! We haven't had a whole rain-free weekend in some time now, but luckily this weekend is shaping up to be quite nice. Highs will be a tad on the cool side on Saturday, around the upper 60s, while temps will return to the mid 70s on Sunday. Be sure to locate your sunglasses because you're going to need them for those Easter egg hunts! 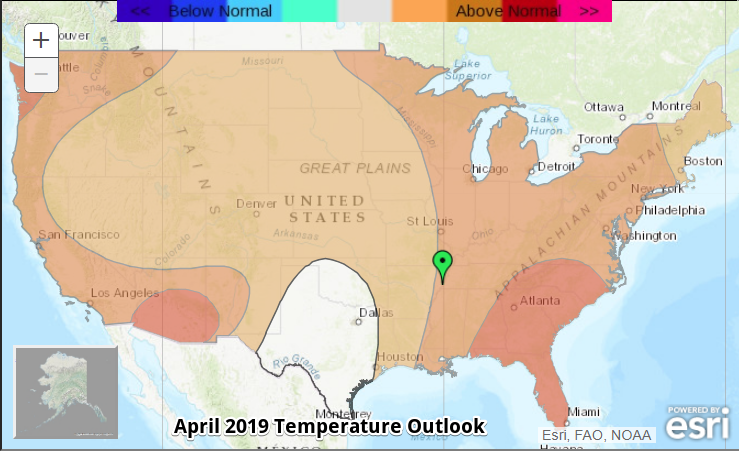 As we reach into the second half of April, temps are expected to continue warming next week providing us with some above average temperatures. Highs next week are expected to remain in the mid 70s to near 80. It is April though, which means showers and thunderstorms will once again be possible by the middle of next week. Carrying over from the end of February, March started much colder than average with the first week averaging over 15 degrees below normal. Snow flurries even flew on the 4th as high temperatures didn't crack the freezing mark. 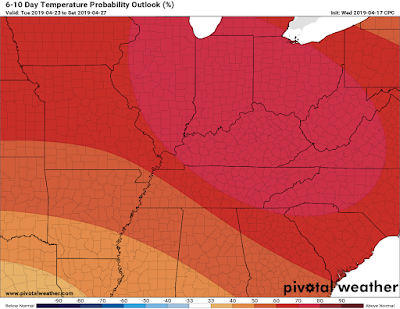 A warming trend occurred during the second week bring temperatures back to near average before highs reached the mid 70s mid-month for a couple of days. Thunderstorms accompanied a cold front that dropped temperatures back to just below average for over a week once again. The final week of the month saw variable conditions with highs ranging from the 50s to 70s and a few rounds of thunderstorms. The second half of the month was drier than the first. The last sub-freezing temperature occurred on the 7th. Overall, temperatures were well below normal for the month and precipitation was also moderately below normal. There was a trace of snowfall on the 4th. 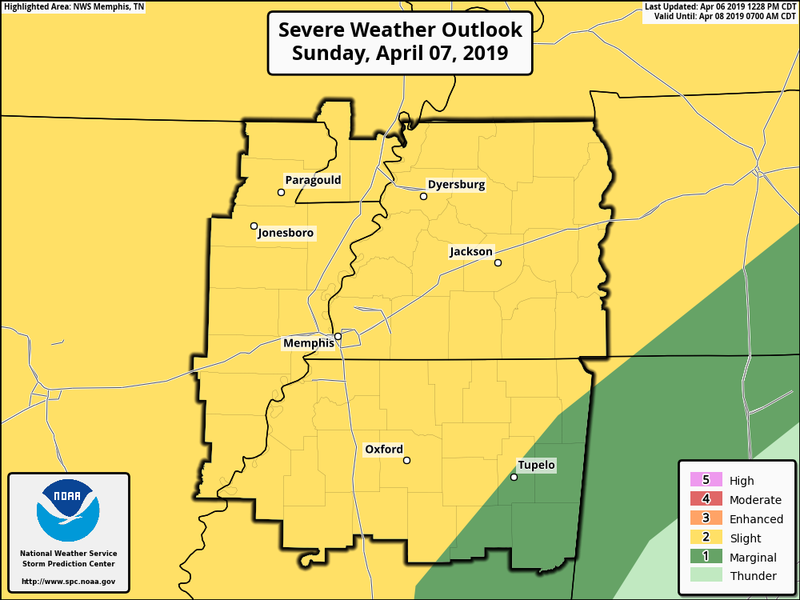 As far as severe weather, Severe Thunderstorm Warnings were issued across north MS on the 9th and 14th and Tornado Warnings were issued well east of the metro. Another Severe Thunderstorm Warning was issued on the 25th for the norther metro. Wind damage occurred in Shelby County with storms on the 9th and 14th (trees down). There was one injury reported on the 14th as a tree fell onto a home in strong non-thunderstorm wind. Hail was also reported on the 14th in DeSoto County. Comments: Five days dropped to or below freezing this month, 2 above average. March 4th recorded a high temperature of 31 degrees, the second coldest for that date on record. The low of 20 degrees that morning was the 5th coldest on that date, averaging out to the 3rd coldest March 4th on record. Comments: Three days recorded more than 0.5" of rain, only one of which was over 1". 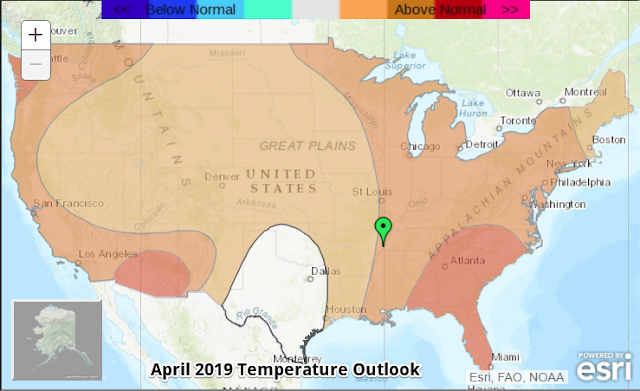 The April climate outlook for the United State from the Climate Prediction Center is shown below. After a cold March, temperatures are forecast to jump to above normal for much of the U.S., except portions of Texas. As a result, odds favor overall warm temperatures for Memphis, with a 41% chance of above normal temperatures, a 33% chance of near normal temperatures, and a 26% chance of below normal temperatures. 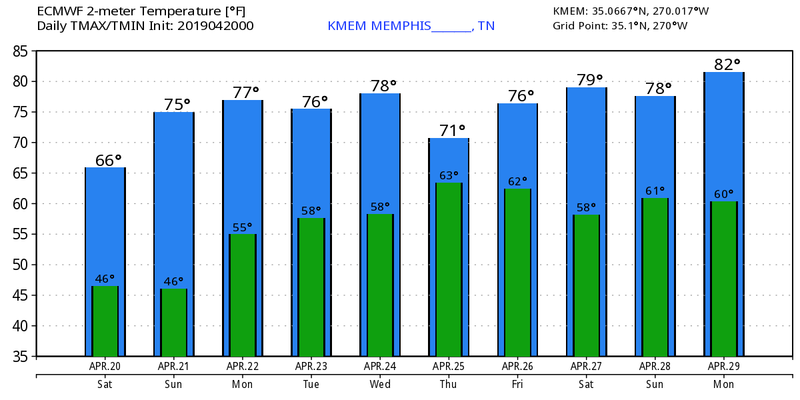 Memphis typically averages 62.9 degrees for the month of April, or nearly 9 degrees warmer than a typical March and 13 degrees warmer than March 2019. A wet April is forecast for the southwestern and southeastern U.S. with near normal precipitation for most of the rest of the nation. 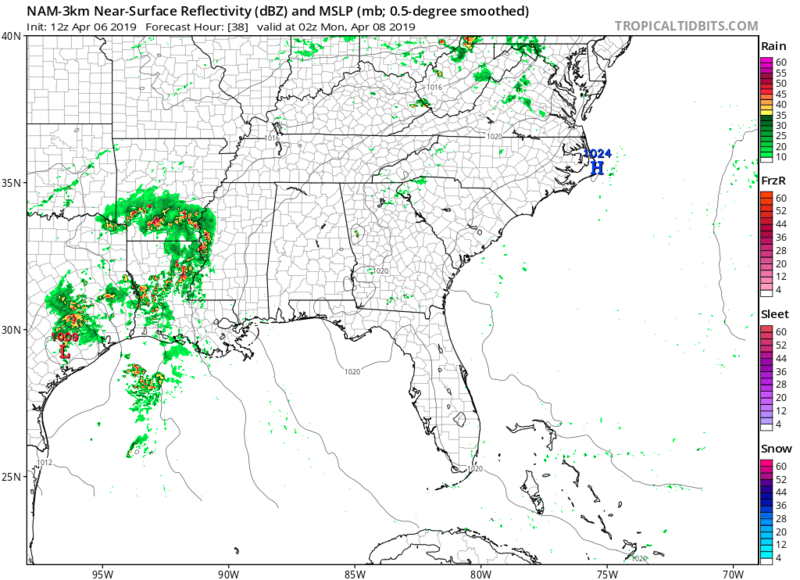 For Memphis, odds favor near normal conditions with a 34% chance of above normal precipitation, a 33% chance of near normal precipitation and only a 33% chance of below average precipitation. April historically averages 5.50" of precipitation. OK maybe so, but if April showers DO have some thing to do with springtime flora, then we must be angling for a colorful May! Officially, we've already had nearly 4" of rain this month, and my mid-month paycheck hasn't even arrived yet. It's possible we'll pass the (entire month) April average rainfall this weekend. Let's get into it. A cold front snuck through the area while you were sleeping last night. You already know that because multiple days of 80s has been rudely replaced by the 60s today. I expected we'd see more sunshine, but the upper level jetstream has continued to pour high clouds over us, limiting warming a bit. While not unpleasant, it is a bit cool after getting used to the warm temperatures. Early Saturday morning, that front starts to retreat north again as another front drops south, bringing the first of potentially several rounds of showers in a 24-hour window, just in time for your morning gardening or sports activities. Morning plans need an "in case of rain" backup. 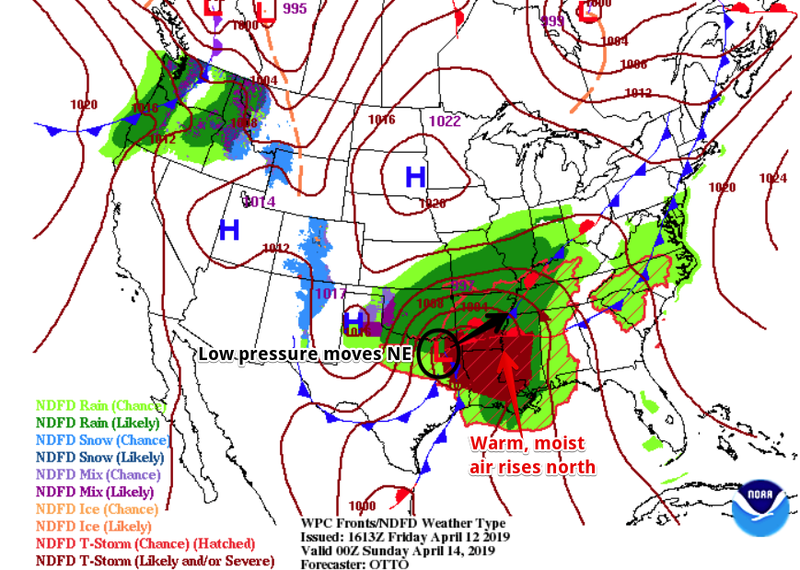 As the fronts both have influence over our weather Saturday, upper level disturbances moving through a strong southwest jet stream set the stage for additional rain chances. Timing of these is near impossible, so we're going to call it "scattered showers" for the majority of the day. We'll give a slight edge to the morning hours over the afternoon for which period is wettest. It won't be any warmer tomorrow either, thanks to the rain chances and plenty of cloud cover. In addition, a gusty east wind picks up in the afternoon that could sustain itself near 20 mph and gust to 30+ mph. An east wind is also not conducive to much warming. Look for maybe 3/4" to 1" of rain prior to dinnertime Saturday. This is when things get more interesting. 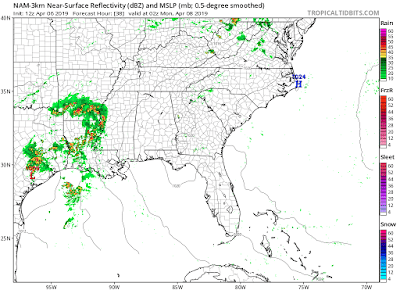 Strengthening low pressure moves out of Texas and makes a beeline for the Memphis metro. Rain chances increase into the evening as that wind remains strong. Some rain will be heavy Saturday night. We could see some urban flooding in those typical low-lying areas after dark. Remember: turn around, don't drown! In addition, the approach of the low will drag the warm front that resides to our south back northward. At least portions of the greater metro enter the "warm sector" of the low, which means the severe weather risk goes up as instability climbs (yes, even after dark). There will also be plenty of wind energy with this system to enhance storm activity. Thunderstorms are a good bet for the metro area, but north Mississippi stands the best chance of severe weather. 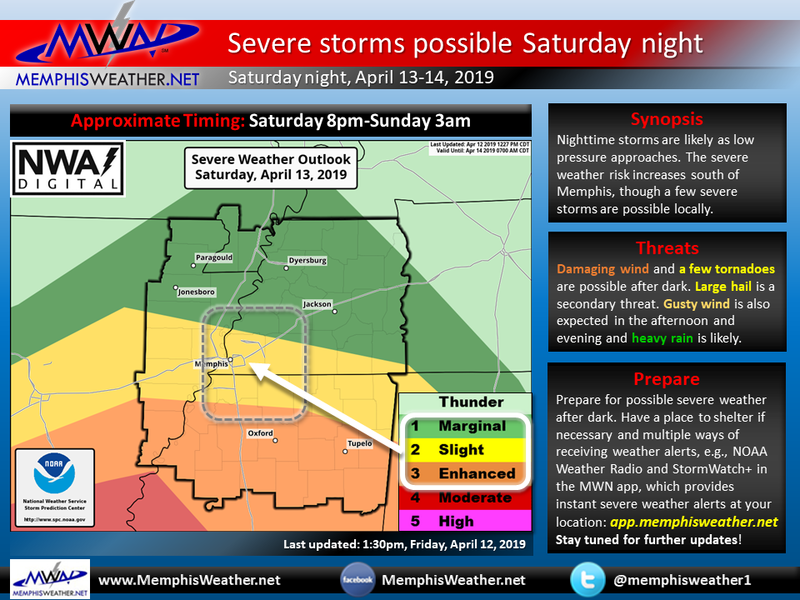 The most likely timing for any severe storms is 8pm until 3am Saturday night. Risks include damaging straight-line wind, some hail, and a few tornadoes. Currently, the Storm Prediction Center, the NWS severe weather experts, provides a range of severe weather probabilities for the metro: from a category 1 Marginal Risk (Tipton County) to a category 2 Slight Risk (the heart of the metro, including Memphis/Shelby), to a category 3 Enhanced Risk (southern Tunica, Tate, and southern Marshall Co.). See the maps below for the overall risk area across the southern U.S., as well as a zoomed view around Memphis. The highest risk of tornadoes will be south and west of the metro in the category 4 Moderate Risk area, though a tornado can't be ruled out near and south of I-40 in eastern AR, northwest MS and southwest TN. You should prepare for the possibility of all modes of severe weather after dark tomorrow night. 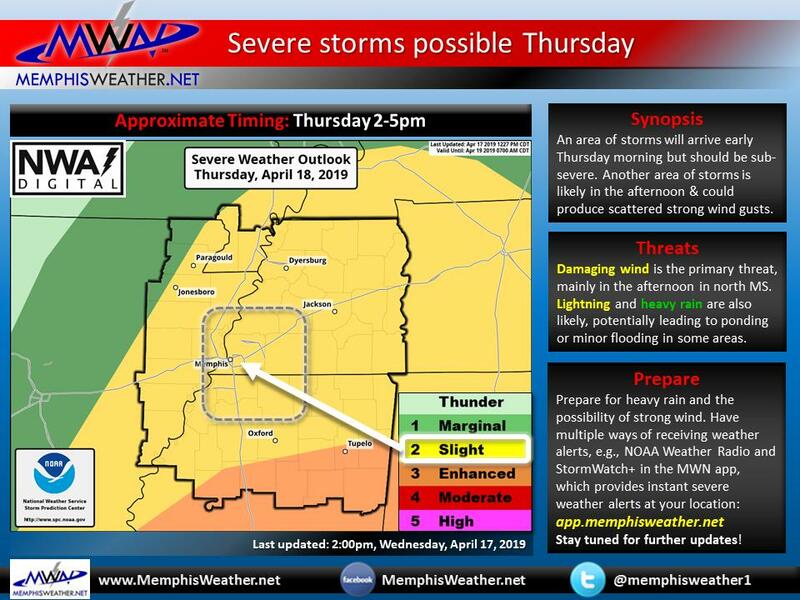 Consider where you'll be and where you can take shelter if necessary, but particularly south of Memphis. Note also that this risk area can, and likely will, be adjusted Saturday multiple times as more detail becomes available on how the storm is progressing. If the low tracks a bit further north, that warm sector could lift further north into the metro, raising our severe weather chances. If it is suppressed south a bit, our severe weather risk diminishes a bit. 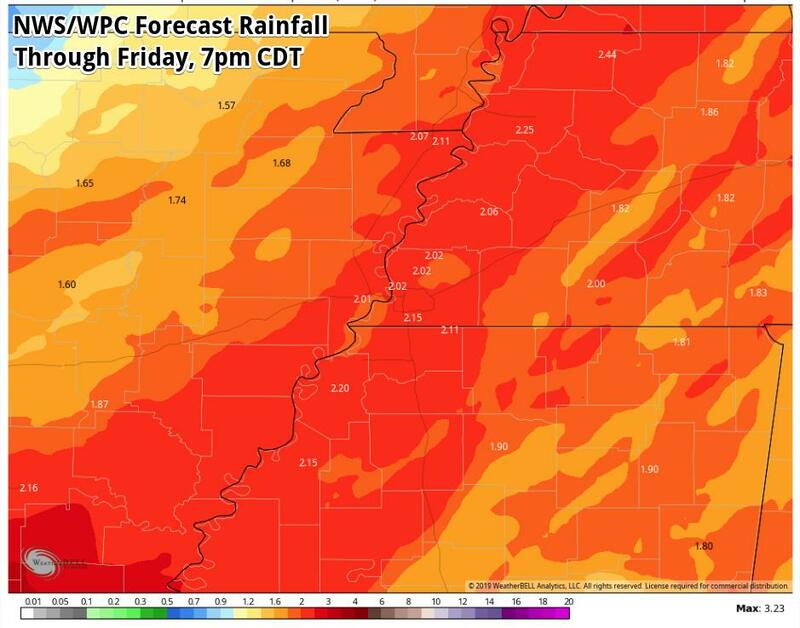 You MUST remain weather aware tomorrow as the situation is dynamic and the potential is real. After about 2-3am Sunday morning, the weather looks to settle down quite a bit, with lingering showers possible into Sunday morning. Have Sunday morning plans outdoors? Consider a rain alternate, though heavy downpours are not expected. 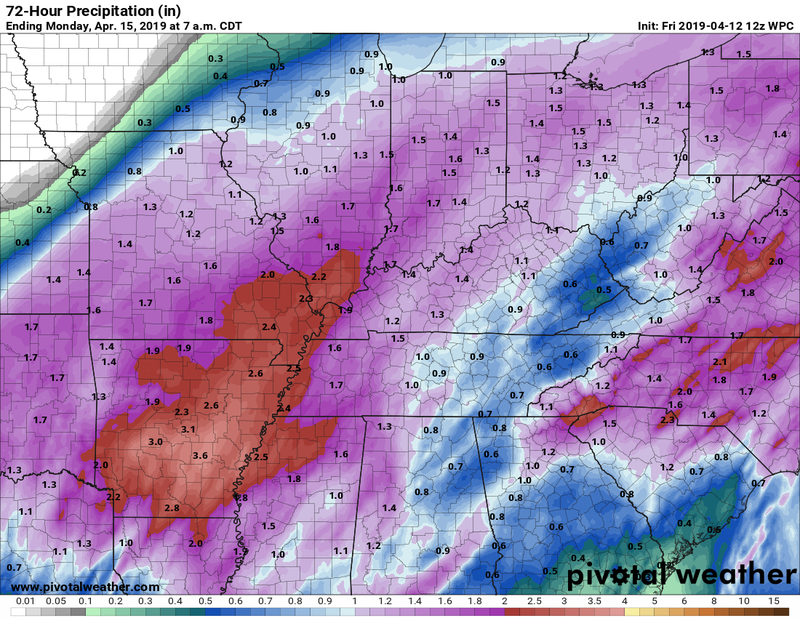 Total rainfall from this events will likely be well over an inch, and could fall in the 2-3" range in spots. 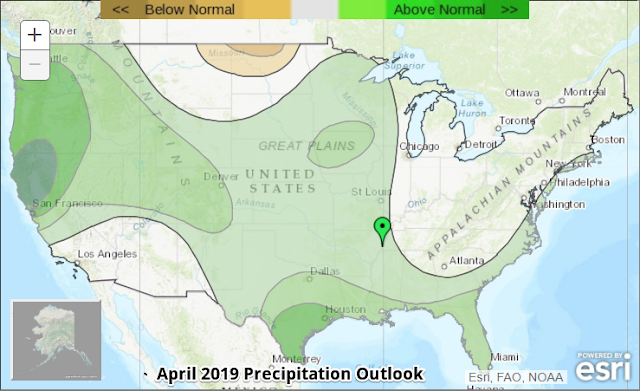 That would likely push us over the normal April rainfall total of 5.5" as we head towards the second half of the month (which I am certain will not be dry). NOAA's Weather Prediction Center forecasts widespread 1.5"-2.5" rainfall totals with this weekend's event. The next round of showers and thunderstorms arrives Wednesday-Thursday with a possible risk of severe weather once again. We'll have more as we draw closer to the event, but for now, plan to enjoy the sunshine Monday and Tuesday and remain alert on Saturday! 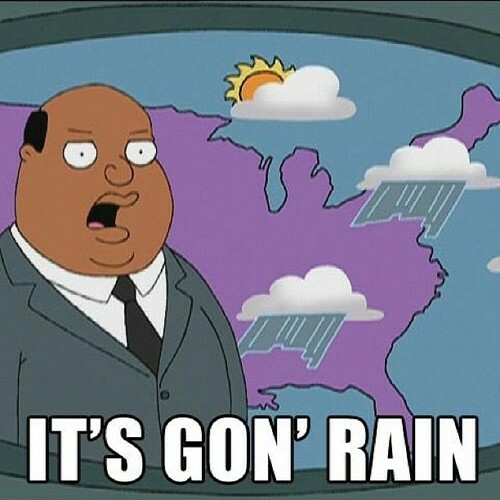 We have storms in the forecast for tonight and tomorrow. I'm sure some might take that as a surprise with such awesome weather outside at the moment. That said, your Saturday daytime is looking good. Skies are going to remain mostly sunny until around 3-5pm: cloud cover will start to increase ahead of the storms that will be pushing in this evening. Temps are going to make a hard push to reach 80, but will likely fall just short in the upper 70s. 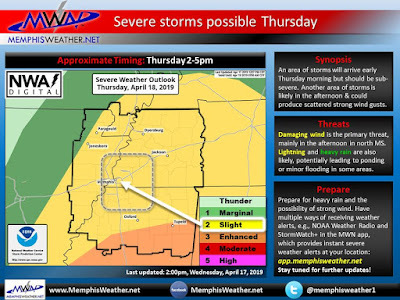 Today's SPC Outlook highlights a majority of the Memphis metro under a Slight Risk for tonight's storms. The greatest risks tonight are strong winds and hail. Current timing for tonight's storms will range between 8pm and midnight. 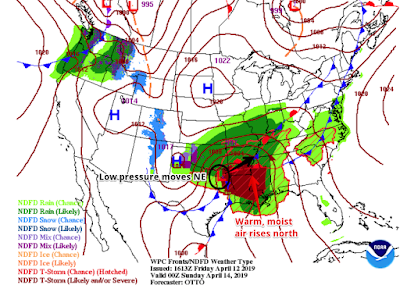 A warm front, tied to a low that will bringing more opportunities for severe weather into Monday, will start to lift through the Mid-South starting around 6pm. This will bring increasing cloud cover late this afternoon. Before the storms, a few isolated showers could be possible. As tonight's storms push through, our greatest risks will be damaging winds up to 60 mph and hail up to 1 inch. Given the dynamics of this event, the threat of any tornadic activity remains to our southwest. After the storms move out this evening, we will get a temporary pause in rain, besides some likely isolated sprinkles. This will place us in the warm sector of the low pressure system that will be progressing eastward. Temps will only drop to 64. 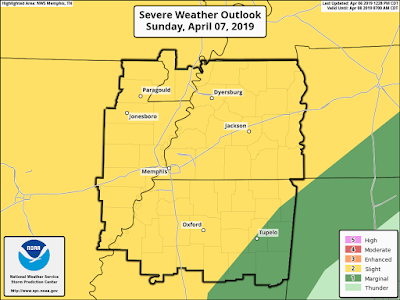 The SPC Outlook for Sunday places the entire MWN area under a slight risk as we watch for a series of waves to push through Sunday that will be bringing storms. Right now, the ugliest of these waves looks to move in Sunday morning. 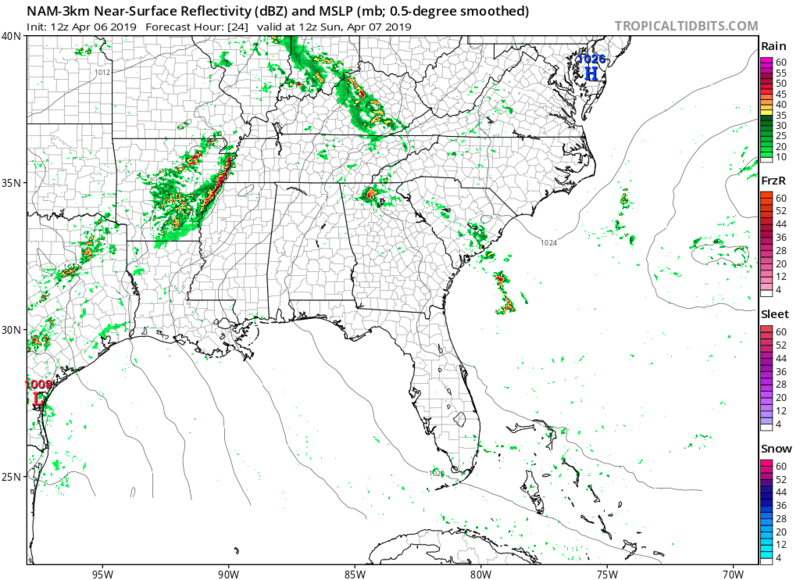 The dry period after Saturday night's storms will provide an opportunity for conditions to become more favorable for storms as the atmosphere saturates and becomes more unstable. A series of waves are possible throughout Sunday ahead of the cold front that will finally arrive Monday. Right now, the focus of all these waves are on the one that currently looks to move through Memphis around sunrise Sunday morning. Threats still remain aligned with Saturday's of damaging winds and hail possible, but there is a very low risk of a brief tornado added. A wave of storms are set to move through the Mid-South Sunday AM, making round two of storms over the next few days. Source: Tropical Tidbits. 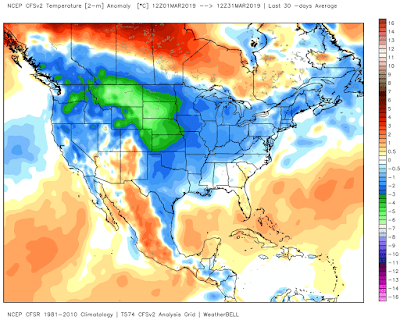 Model consistency from this point goes downhill, so all of this is subject to change. After the morning storms. It appears that we get a break in the weather for a bit. Conditions will remain mild throughout and perhaps some brief glimpses of sun will make it through. Temps are set to again climb into the upper 70s. The break in weather ends during the afternoon and evening with a possible two wave set of storms that will be moving through. All threats will remain the same as the morning. That last wave is set to run into Monday AM as the front finally pushes through. Keep up-to-date on the latest with our social media where we will let you know of any changes in our forecasts! 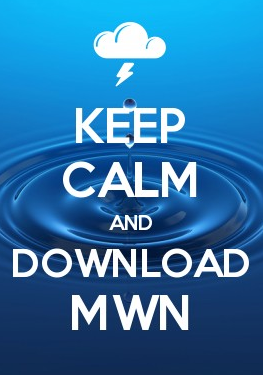 This is my last blog with MWN! It has been a great opportunity serving the Memphis community over the past year and a half! Likewise, it has been such an honor to learn from Erik and all of you in the Memphis region who help give insight and what weather communication techniques work best for the public. That said, in May after this semester is over, I will be moving to Blacksburg, Virginia, to start working for the NWS office there. This is exciting news since my family is originally from that region. The only bad part will be that I am temporarily leaving my fiance who lives and works in Memphis. Who knows, maybe one day I will be returning? Reggie has been a fantastic addition to MWN the past year and a half. He has served us, and you all, extremely well with his timely and accurate social media updates, and sense of humor that kept it "real" on the blog and Facebook / Twitter. We'll miss him a great deal, but certainly wish him all the best as he begins a career pursuing his passion for weather and science. Thank you Reggie for your dedication to the Mid-South. You'll make a great addition to the fine public servants at the National Weather Service!